Bringing the outside in, today’s workspaces are increasingly mirroring the lush green landscapes of the great outdoors. From cascading fountains to botanical-rich workspaces, companies big and small are creating natural, park-like environments. More than aesthetically pleasing, greened indoor workspaces are good for people and for business. These calming spaces are designed to reduce stress, enhance overall wellness and boost productivity and efficiency. Plus, they offer financial benefits for property owners and developers. We look at the myriad of ways nature can improve workspaces and serve as good investments for landlords. Employees’ wellbeing is crucial to the success of any business. Incorporating greenery like plants into workspaces is a good way to keep them happy and healthy. Plants aren’t just pretty to look at; they also provide remarkable health benefits. For starters, they’re natural air purifiers. Bringing them into office spaces can reduce toxins—essentially becoming a great air filtration source. As the NASA Clean Air Study points out, plants can trap air pollutants in its tissue providing cleaner air for employees. It’s important for developers to keep in mind that adding plants can be an attractive, practical and cost-effective way to improve air circulation. Plus, thanks to their natural filtration system, sprucing up the space with plants can also prevent the spread of nasty germs and viruses that keep employees home sick, reducing productivity. In fact, a recent report by the University of Twente, VU Amsterdam and CBRE found that implementing greenery into the workplace design has substantial benefits. The study of 124 employees at CBRE’s Amsterdam office found that adding plants to the office floor energized 76 percent of the workers surveyed. Seventy-eight percent of employees reported a boost in happiness, while feelings of healthiness improved in 65 percent. Plants aren’t the only natural way to bring wellness into the office. Enhancing workspaces with water features can add peace and calmness to employees, giving them a sense of serenity. Whether it’s the beauty of a man-made waterfall that brings visual interest or the noise-cancelling sounds of a trickling fountain, indoor water elements can create a soothing work environment and reduce stress. 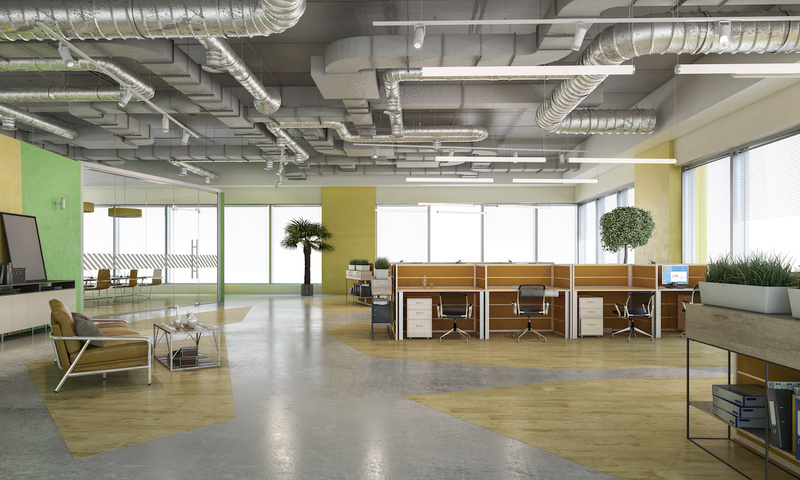 For office spaces in dry climates, the presence of running water can also provide moisture. Droplets from fountains and water features evaporate into the air, providing just the right amount of humidity—eliminating stale air and promoting an overall healthy environment and tranquil ambiance. It’s no secret that when employees feel good, they work better. Less stress translates to heightened concentration and mindfulness, ultimately improving task performance. For larger offices with outdoor spaces, inspiration can be drawn from water features and eye-catching greenery—not only boosting employee moods and performance levels, but also attracting foot traffic and adding to curb appeal. Properly landscaped office exteriors can suggest an impressive interior, creating interest to passersby and potential employees. For developers, that’s key. In today’s competitive job market, with millennials projected to make up 75 percent of the workforce by 2025, employers and developers must work to ensure they’re providing prospective employees with the most attractive workspaces—both indoor and outdoor. Since studies indicate that work environments are a big concern for employees, landscaping can potentially play a defining role in attracting and retaining top talent. Additionally, beautiful, well-maintained exteriors can entice higher-caliber tenants, resulting in lucrative rents. Potential tenants are far more likely to sign secure, long-term leases with property owners who maintain and invest in the appearance of their buildings. Offices are where many people spend most of their day. That’s why it’s imperative that employers and developers acknowledge and embrace the benefits of incorporating greenery and water features into their workspace designs. Enhancing work environments with wellness and beautifying elements are a win-win for employees, employers and property owners.